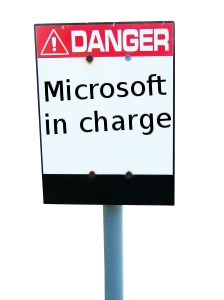 MICROSOFT gets sued quite a lot, and this latest lawsuit is by all means justified. A class action lawsuit places the spotlight on T-Mobile, subsidiary of Deutsche Telekom (NYSE:DT) and Microsoft (NASDAQ:MSFT) for losing most all the contacts, appointments, photos and other data stored by as many as one million users of the popular T-Mobile Sidekick line of mobile phones. The T-Mobile Sidekick data service went down in early October and then T-Mobile admitted that Microsoft’s Danger, Inc. subsidiary, which is responsible for the Sidekick data service, lost most all of the personal data it was entrusted with protecting, and that it was highly unlikely it would recover any data. Microsoft Nick tries to downplay the lawsuits and CRN agrees that it may be the end of the Sidekick. Many T-Mobile customers saw Microsoft’s February 2008 acquisition of Danger as a death knell for their beloved Sidekick. As one source put it a while ago, “T-Mobile halts Sidekick sales after data loss” (that’s the headline which percolates through the wires). Lobel said that going forward, responsibility would have to be determined on a legal front as cloud services gain more traction with customers. And ultimately, he said, the company trusted to directly manage customer data should be held responsible for its loss, whether it’s outsourced or not. The Seattle press and The Register look at some other issues while the Wall Street Journal generalises this to Windows Mobile. GigaOM calls it “Microsoft Mobile’s Worst Week Ever” and one of our readers writes about the highly disappointing Windows Mobile 6.5. To say I was a dissatisfied customer would be an understatement, however thats in the past. I’ve learnt my lesson and won’t consider a Microsoft solution in a phone ever again. I will not though dwell on that and after previous bad experiences with other Microsoft technologies I only have myself to blame for the decision to purchase it. Amid all the talk last week of a “groundbreaking” partnership between Verizon Wireless and Google, word of Microsoft launching its revamped operating system, Windows Mobile 6.5, and Verizon introducing one of the first smartphones to run it, the HTC Imagio, largely fell on deaf ears. The Verizon-Google partnership is a big deal. It not only ensures Google’s touch-screen Android operating system will make it onto cell phones nationwide, it finally will give consumers a worthy alternative to the Apple iPhone and AT&T. A week ago we wrote about Samsung's bad impact on Android and now we find Microsoft’s friend Samsung ganging up to advance Windows Mobile [1, 2, 3, 4, 5].